Coal storage yards have traditionally been left in the open. Fuel stocks can extend over many acres and, in some cases, the stockpiles shift in shape as material is brought in and pushed around with heavy moving equipment. A typical power plant may stock 300,000 tons of fuel in yards extending over 11 acres (4.5 hectares). Despite these failings, the large footprint of a coal yard made it impractical to think of covering it. Industry, government and the public simply accepted an open coal yard as a consequence of using this type of fuel. Even though the status quo is changing, and now more and more companies are aware of the legal and environmental reasons to cover their stockpiles, Geometrica has been covering stockpiles and offering solutions since 1992! Today, our covers and domes can be designed in varying curvatures, shapes and sizes for complete flexibility. Environmentally conscious power plants and industrial solid fuel users are now covering their fuel stockpiles. Coal stockpiles vary in both size and shape. These stockpiles range in size from 30m to 300m. And, from small to large, there are typically four shapes: conical, ring, longitudinal, and free-form. Each type presents unique challenges to covering them. When material drops from a fixed conveyor onto the ground it creates a conical pile. The pile's base is circular, and the slopes of the cone are given by the "angle of repose" of the material. Conical stockpiles are usually not very big because of two issues with dropping coal from a fixed conveyor: (1) dust is released in large quantities when there is wind, and (2) air is trapped in the coal pile. The first issue is easily solved with a cover. The second issue promotes spontaneous combustion of the coal and it is perhaps the primary reason to keep conical fuel piles small. Nevertheless, these types of piles are fairly common in industries that burn moderate amounts of coal, such as cement plants and fertilizer plants. If the stacking equipment pivots 360° around a centre point, it forms a ring stockpile. 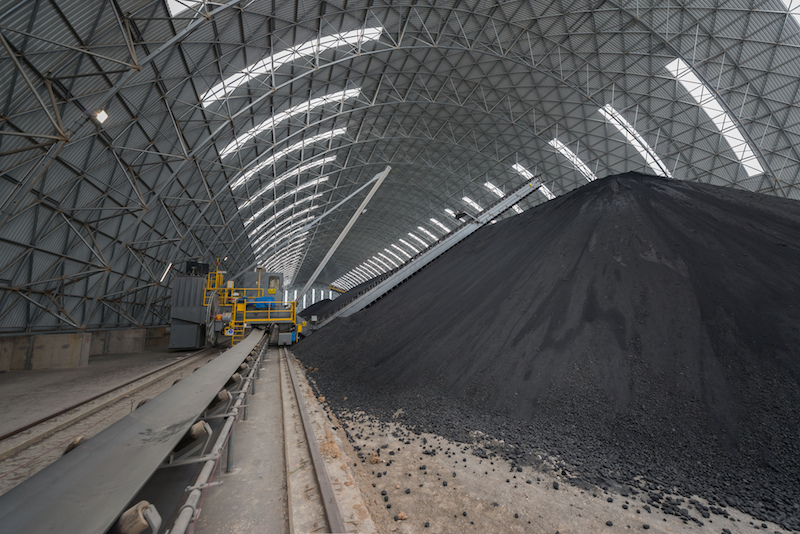 Large volumes of coal are stored with a relatively small footprint. Ring stockpiles can rest on the ground, or be contained by a concrete wall. Longitudinal coal piles are covered with "vaults" or "longitudinal domes". 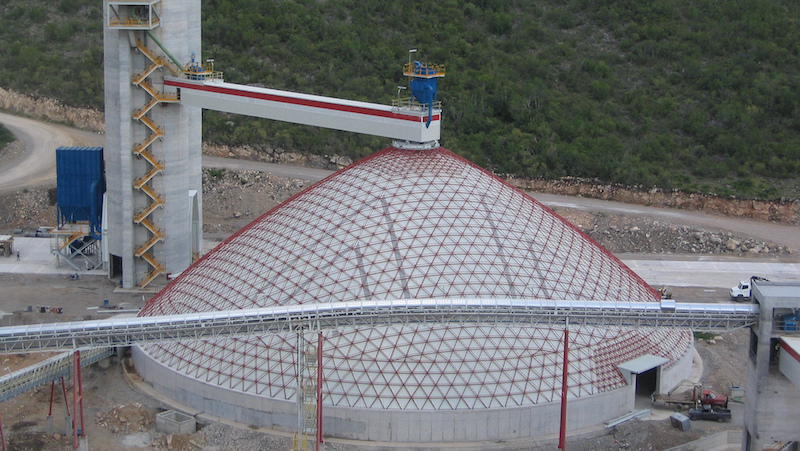 In addition to the stockpile itself, longitudinal domes must cover conveyors and stacking/reclaiming equipment on either side of the stockpile. Often, the stacking equipment is shared by two adjacent piles. These are called "double piles". To cover them a vault must clear a much wider span. Typical vault spans for single piles are between 50m and 80m, and, for double piles, over 90m. 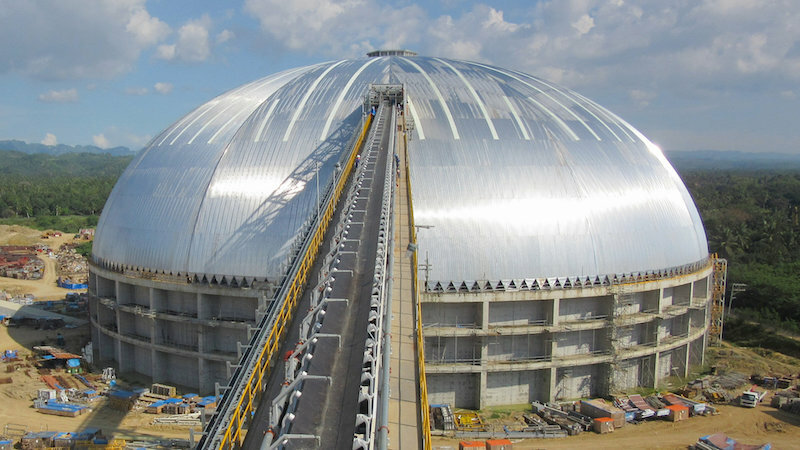 Geometrica has designed and built longitudinal domes that span up to 110m and extend for hundreds of meters. When double piles require vault spans longer than 100m, it is worth considering covering them with a free-form dome, as next described. Stockpiles are not always conveniently shaped and located on even terrain. Often, these "free-form" stockpiles cover a massive area and are continuously changing with moveable conveyors, truck drops and bulldozers. Many are also surrounded by pre-existing buildings, fence lines or equipment. Geometrica's freestyle geodesic dome is even trademarked - Freedome®. This incredibly strong superstructure can span irregular shapes up to 300m on uneven terrain without any interior columns. We understand that many stockpiles must remain in operation while being covered too. Stockpiles can remain in operation while being covered and it can be accomplished safely, rapidly and economically without heavy machinery, scaffolding or welding. Reduced time, labor and equipment also equate to a lower total cost of installation. 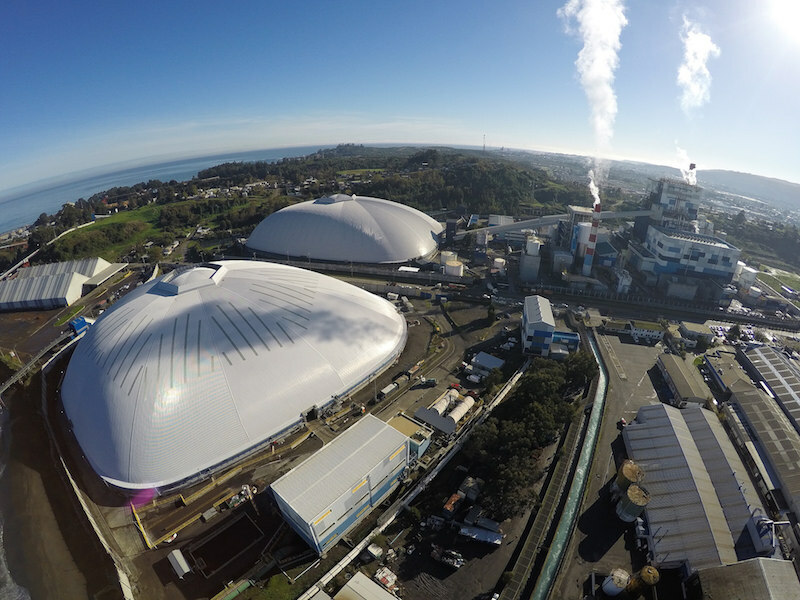 Regardless of geography or climate, Geometrica designs domes that deliver both business- and eco-friendly solutions. We believe that industry and nature can coexist on some of the largest scales imaginable. Our mission is to provide customise storage for coal around the world. The questions is: "What can Geometrica do for you?"